More often than not, your interview panel will ask if you have any questions for them at the end of your interview. Out of all the questions asked during your interview, the last thing you want is to be caught off guard by the very last question! What is the program’s philosophy regarding __________? If you have questions about their method of teaching, clinical hours, program setup, faculty accessibility, or generally anything that wasn’t covered during the interview, this would be a great way to frame a more generic, informational question. Why are the pass/fail rates so low/high as compared to other programs? This shows that you’ve done your research, are familiar with this program’s stats, and are genuinely interested in learning more about the program’s success. What is your program’s first time pass rate for the national board exams (PANCE)? 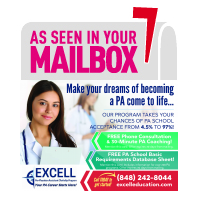 Students who finish PA school must pass the Physician Assistant National Certification Exam (PANCE). If a program had a low initial pass rate, their caliber of instruction may be poor or their curriculum may not prepare you well enough to pass. What are this program’s criteria/standards when selecting teachers/professors? Having a high level of interest in the professors indicates that you’re not only interested in the program, but in the quality of the teaching staff as well. It may also indicate that you understand the caliber of this program’s academics. Could you tell me more about the hospital rotations I will be doing in your program? Every program is different, so you’ll want to be sure this program provides adequate opportunities for you to focus on specialties if you so choose. If you don’t have a good sense of what your rotation schedule will be like or which facilities are available for rotations by the time your interview is over, make sure you ask this question. Is there job placement assistance for graduating students? While the PA profession has plenty of available positions, any program worth their weight should provide exit counseling and job placement services for their graduates. You’ll want to be sure the program you choose is committed to helping you during your time in the program and afterwards. This also indicates that you’re focused on your success as a practicing PA rather than the short-term. Not asking a follow up question could give the impression that you don’t care, that you lack the motivation to critically analyze the program you’re applying to, or that you’ve let your nerves get the best of you. There are plenty of other questions you can ask and, above all, you want to use this time to get answers to any of the burning questions that haven’t been answered so far. If you don’t do this, it might be harder for you to make a decision once you’ve know which programs have accepted you. No matter what you ask, make sure you’re not left speechless at the end of your interview!